In advocacy work, we are often reminded of the words of the prophet Micah, “You have been told, O mortal, what is good, and what the Lord requires of you: Only to do justice and to love goodness, and to walk humbly with your God” (Mi 6:8). The love of Christ impels us to advocate for the least among us, the shunned, the outcast, the disabled, the disenfranchised and the underprivileged. Made in the image and likeness of God, we are called to be in right relationship with God and all our brothers and sisters –– regardless of their nationality, ethnicity, age or gender. Worth is never merely determined in isolation, but rather in the interpersonal relationships with one another and God. I propose this is what it means to be pro-life: to exercise genuine love and respect for every human person from conception to natural death. Realizing respect for persons in the midst of humanitarian crises and social injustices is just as pro-life and just as important as any other life issue. Brothers and sisters, let us never find a situation where we can bring ourselves to advocate for some life issues and disregard others. If we truly love the Lord, we must take care of one another — we must love one another. There can be no true justice, no true harmony, no true righteousness and no true integrity without love. 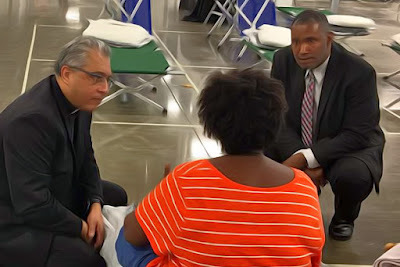 A few months ago, the U.S. Catholic bishops penned “Open Wide Our Hearts: The Enduring Call to Love,” a pastoral letter against racism. The title of the pastoral letter speaks to the very heart of our Christian responsibility to make room for others in our hearts. Very often, I hear people say, “I don’t see color.” I recognize this as a well-intentioned comment, but until all people come to an authentic awareness of where they fit into systems of power and oppression historically, the comment often possesses no real meaning. Collectively, we are called to a real conversion of hearts to meet the stranger among us and to engage in courageous encounters to raise more awareness of racism, poverty and all other forms of violence that threaten human life within our communities. As we endeavor to open wide our hearts to love, let us encounter and accompany one another to work to change the structures that work against the sanctity of life. It is not enough that we simply pray about the issues affecting our communities, we are called to participate in opportunities for meaningful action. In our advocacy, let us promote the sanctity of every human life by learning more about the legislative priorities of our church, participating in advocacy day, and meeting with state legislators to discuss the issues that affect the common good.